Nakaya | This used to be my second life as a verb. Ishi-me kan-shitsu, is that you? It has finally arrived, my fourth Nakaya – and my first direct order from Japan. Ishi means stone. 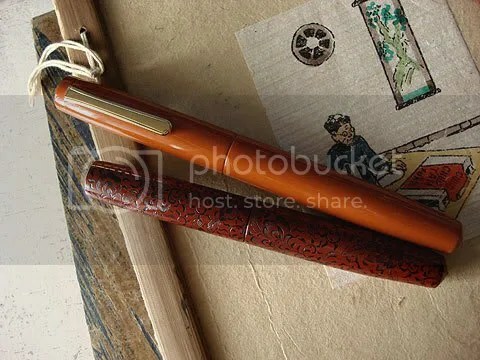 The Nakaya craftsmen layered silver over a brown body. The result is a deep gray with light gray highlights that will become lighter. I expect the pen will look worn over time, like rocks in a river. 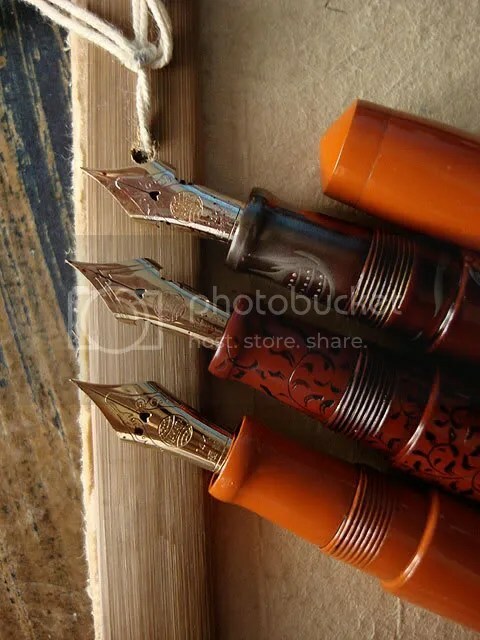 I ordered a fine flexible nib, and while it is not a full flex, it is certainly pleasant to use and capable of line variation with a light touch. There were three contenders for my affection in Aesthetic Bay last Sunday, all by Nakaya: a kuro-tamenuri Decapod, a cherry blossom Sumi, and a Piccolo with clip in arai-shu. The Piccolo won. It is the longer Piccolo, commissioned by Aesthetic Bay from Nakaya, because several of their customers liked how the Piccolo looked but were uncomfortable writing with such a petite pen. 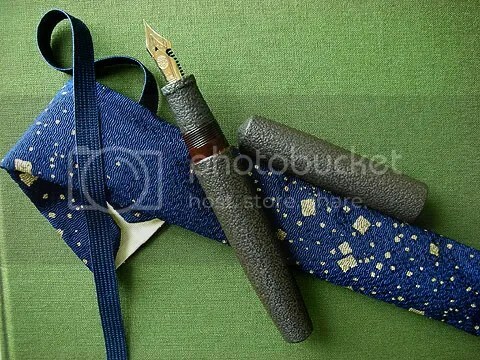 According to the Nakaya website, “arai” means washed, or faded. Arai-shu is faded red. I have to admit it was the color that won me over. I have yet to find an orange ink to match this delicious finish. In the meantime, I am using Private Reserve Orange Crush, which for some reason is not orange but a dirty yellow. (It is possible that this is ink gone bad.) I think Caran d’Ache Saffron would be better. This new Piccolo has an extra-fine nib. Beside my original Piccolo, it looks like a Tuba. Who knew there could be so much variation amongst fine nibs? Here are the three nibs on my Nakayas: regular extra-fine, elastic fine, elastic super extra-fine. 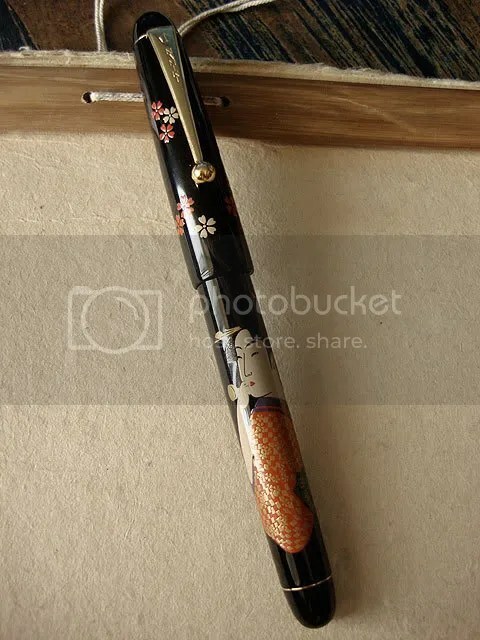 On a side trip to Elephant & Coral, after a lively merienda with the gorgeous Itsy, I decided on a Namiki maki-e. One of the women from the Floating World found her way to this pen, and several cherry blossoms followed in her wake. 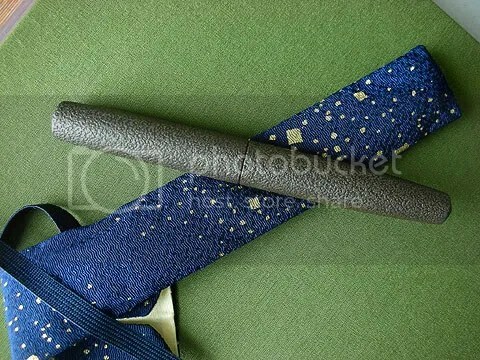 The Nakaya Ascending Dragon is coming home! Thanks to a friend who’s in Singapore for a conference, my pen will be on its way home in a couple of days. I sent it out for a nib exchange – from a standard fine to a super elastic extra-fine. I can’t wait! 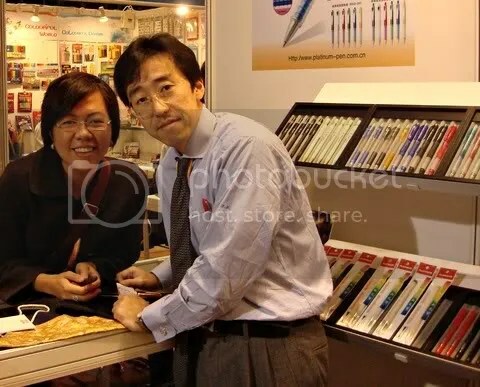 Nakaya at the HK International Stationery Fair. So this is what I was up to, really, in HK. 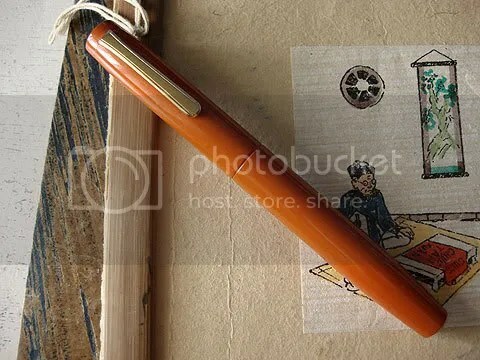 I wanted to see a Nakaya table! Other people fly to Tokyo to see Madonna. This is not a strange thing. He said, “A Nakaya owner!” I pulled out my Chinkoku and proceeded to tell him about my purchases at Aesthetic Bay, and how much I liked the Sumi technique (only one Nakaya craftsman can do this) and he brought out a long writer model that had the story of Rashomon executed in Sumi. The Ascending Dragon desk pen was also there, and a raised-technique dragon pen rendered in gold and red on black. The humidity in Okinawa means it takes four months for pens in that style to dry. Also on display were a golden maki-e squirrel on a blue body, two siblings of my Piccolo, a spider in gold and silver on a black body with a golden butterfly on the grip, and another spider pen in a multi-layered technique that even to the untrained eye looks like the highest level of craftsmanship. I also held my first kanshitsu (stone finish) pen, rendered in silver over deep brown. It was a non-standard Piccolo, longer than mine. Mr. Nakata refused to sell me anything! And I thought, how wonderful. Instead, he got my name and set aside the kanshitsu for me, noting down my nib preference. I brought out my Omas Arco with the modified nib and he compared it with my Nakaya elastic fine, as I was asking if it was possible to achieve the same kind of flexibility with Nakaya nibs. In the process we got inky fingers; I was profusely apologetic (I had forgotten to wipe down my pen after traveling with it loaded). He was very obliging. I left the HK Convention and Exhibition Center with the widest of grins.